No special equipment is needed to carry out this project. All that one should have is a long straight pole or a rod, an open area where the sun shines from about 10 a.m. to 2 p.m., a measuring tape, and a good watch. The pole is fixed exactly vertical on the ground. The length of its shadow is measured at different times from 10 a.m. to 2 p.m. From these numbers, the circumference of the Earth can be deduced ! Simple, isn’t it ? If you are surprised, then read on …. Eratosthenes is credited for the first estimation of the size of the Earth, around 240 BC. He was the librarian of the great library of Alexandria in Egypt. He had access to all that was known to the mankind at that time, but he was interested in pushing the limits of knowledge further. It was not such a simple thing in those days to believe that the Earth was round! Most people thought it was flat. But Eratosthenes went ahead to measure the sphere he believed the Earth to be. But, he did not use methods like walking around the Earth or digging a hole through its centre to the other side. The Earth, if cut into two halves, would show a circular section. The boundary of the circle would be its circumference, which we want to measure. Suppose this circle was a Cake. We cut out a slice that is one-sixth [1/6] of it. The curved edge of this will then be 1/6th of the circumference. To put it the other way, the circumference of the cake will be six times the length of the curved edge of the slice. If we measure the angle made by the other two sides, then we would find that it is 60o. It has to be so, because 60o is 1/6th of 360o which is the whole circle. Thus if we know the distance between two points on a circumference and know the angle made by them at the centre, we can find out the length of the circle. This means that if we know the distance between two points on the Earth and the angle they make with the Earth’s centre, we can find out the circumference of the Earth. The distance between two places can be measured. The problem is to measure the angle that they make. This was solved by Eratosthenes. He had heard that in a place called Syene, south of Alexandria, the walls of a well cast no shadow in the water at noon on the day of the middle of Summer. 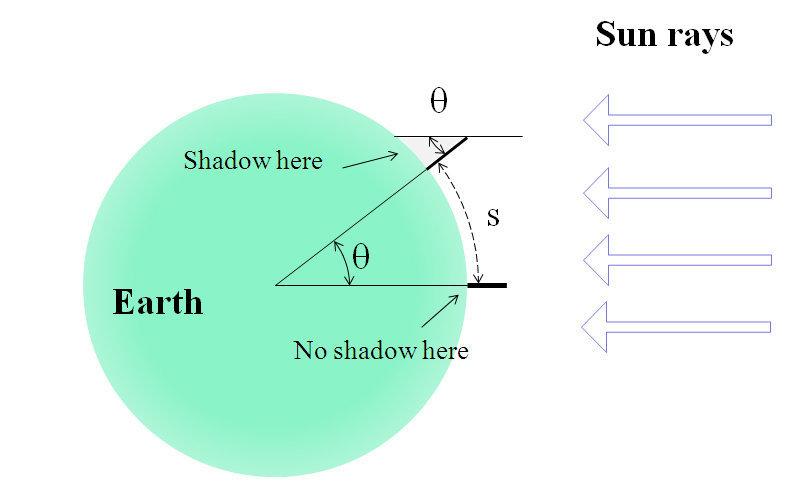 In other words, there were no shadows by vertical objects on June 21st, as the Sun was exactly overhead there at noon. 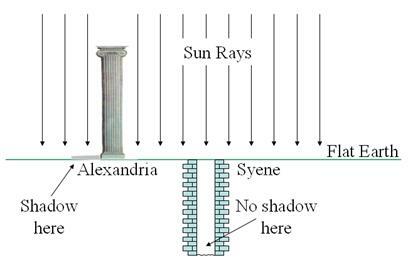 But on the same date he observed that a vertical pillar in Alexandria cast a small but measurable length of shadow. If the Earth was flat, then the sun-rays coming perpendicular to the flatland would make all vertical objects cast similar shadows anywhere on the Earth. 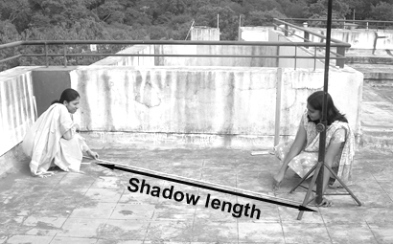 The difference in the length is possible only if the Sunlight comes at different angles at different places. This means that the Earth is a curved surface. 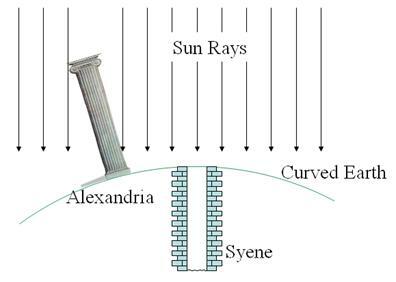 If two sticks perpendicular to the ground in Syene and Alexandria were to extend to the centre of the Earth, they would thus make an angle. Using simple geometry, he found out this angle from the length of the shadow at Alexandria on 21st June. It came out to be about 7o which is 1/50th of 360o. It is said that he got a troop of the army to walk to Syene [now called Aswan] to measure the distance till there. It came out to be 800 km. Fifty times that i.e. 40,000 km, was the circumference of the Earth! The modern accepted value of circumference is 40,075 km. which about 0.2 % more than what Eratosthenes calculated. To get the value of the Earth’s circumference, Eratosthenes had to measure the distance between the two places that he did the experiment at. But now that we know the circumference very accurately, we can reverse the method and use it to find the latitude and longitude of the place where our observations are taken. And as we said right in the beginning – you need no special equipment to arrive at these numbers.